It was in mid 1984 and PeopleExpress was just beginning its descent. That wasn't obvious to everyone; even John Stossel, no easy touch, had give the rapidly expanding airline a smooch on 20/20. PeopleExpress had low fares, its own goofy counterairline culture and enthusiastic crewmembers and ground staff who were also stockholders. It had been started by a renegade entrepreneur named Don Burr. And it was growing like mad, even expanding service to London for $149 each way. But I was commuting on PeopleExpress between Pittsburgh and New York City at the time and, week by week, I witnessed a company that was coming apart even as it continued to expand. PeopleExpess began to make U.S. Air look like a Swiss watch. The PeopleExpress staff was increasingly stressed and losing control of their system. Newark's dilapidated North Terminal, People's cut-rate home terminal, began to resemble a refugee center as flights were canceled without warning, rerouted or, it seemed, simply lost in the confusion. The smiles that greeted the airline's early days were being replaced by swarms of angry passengers. PeopleExpress was gone by 1987, another example of a great concept that could not be sustained by the folks who got it off the ground. That's not going to happen to JetBlue. On Thursday the airline's board of directors pulled the ripcord on JetBlue's founder and CEO, David Neeleman in the wake of February's epic meltdown, in which a winter storm left thousands of passengers stranded. Some sat in JetBlue planes at JFK for up to 8 hours. You don't do that in a city where people get ticked off if a subway is delayed for 30 seconds. The weather has certainly improved here in the Northeast, but things are still a little bumpy at JetBlue, and the board believed it was time to get the company in the hands of a first-class operations guy, Dave Barger, the COO. Barger has proven ops chops, having helped turn Continental around. (Although he certainly has to take some blame for February, too.) In some ways, dumping Neeleman isn't a surprising move. He's a great entrepreneur, but perhaps one of those types who is much better at innovating than operating. The skill sets are vastly different, and many entrepreneurs get bored by running a company and tend to step aside and move onto the next business once the newbie gets on its feet. "This is a natural evolution of our leadership structure as JetBlue continues to grow," Neeleman, 47, said in a statement. The February disaster might have sped up that evolution. JetBlue has recovered somewhat, but there's plenty of room for improvement. JetBlue's on-time performance in March was 63.6% according to the Department of Transportation. That's second worst in the industry, and it flat out stinks. (US Airways is first, but you probably guessed.) The on-time rate improved marginally to 64.8% in April. More disconcertingly, while JetBlue increased traffic 11.6% in April, its capacity, the number of seats available, increased 12.8%. This is not progress. Neeleman has been justly praised, in TIME and elsewhere, for brilliantly formulating JetBlue's strategy and getting it off the ground. You'd be surprised how easy it is to start an airline in the U.S. (Unless your name is Virgin America and the industry freaks about the prospect of a Richard Branson-linked competitor entering the domestic industry.) There are plenty of planes to lease, and loads of pilots to fly them. And that's exactly why hundreds of airline start ups have sprung to life and augered in since the industry was deregulated in 1978. 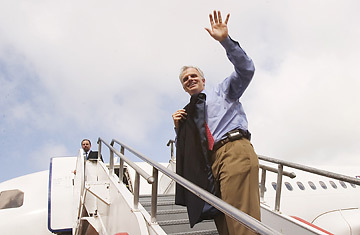 But by the time Neeleman was assembling JetBlue, he had already launched three airlines, including Morris Air, which he sold to Southwest, and WestJet in Canada. Forced by a non-compete clause with Southwest to stay on the sidelines, he spent years figuring out JetBlue. He raised a ton of capital so he could weather any early storms or cut-throat price wars. He bought brand new Airbus A320s to give customers confidence; he equipped them with satellite TVs and gave you enough seat room so that you could open a newspaper without slapping the passenger next to you. He ran the company out of New York's under-utilized JFK airport as opposed to the tumultuous LaGuardia. He clarified pricing so that you needed a computer only to book a flight and not figure out the rules. He treated his employees like he actually cared about them, so they are not the quietly seething, underpaid survivors serving at the majors. The result is a thing of beauty  when it runs right. Oh, that. To make amends with passengers, JetBlue created a Customer Bill of Rights that pays off when flights have long delays. It is now touting the most legroom in coach, a priceless perk for those of us in the 6-foot plus category. And the carrier continues to expand, most recently to San Francisco. But a guy like Neeleman  constantly thinking of new ideas, doing the what-if stuff, puzzling over overseas expansion  becomes less useful as CEO when it's more important to know exactly how many crewmembers you need in Miami next week, or whether you are sufficiently hedged on fuel costs. So as chairman of the board, make that non-executive chairman, he'll have more time to figure out ways of improving the airline industry. And that could keep a body occupied for years.